On-site mentorship has been shown to be the most effective means of enhancing the training experience and reducing the learning curve mishaps. Telementoring utilizes modern videoconferencing technology to allow an expert surgeon to observe a distant surgery in "real time" and provide interactive instruction and guidance throughout the procedure. Advances in laparoscopic surgery in the past decade have been rapid and have impacted most surgical disciplines. However, in few instances has the approach become the standard of care. While its application to simple and increasingly complex surgeries has been shown to offer a number of benefits including shorter hospital stays and recovery times, lower complication rates, and superior cosmetic results, the primary factor preventing many surgeons from offering advanced laparoscopic surgery is lack of training. The learning curve for such procedures may be long and many of the skills required simply cannot be acquired in a classroom setting. The complication rates encountered during the learning curve and the medicolegal concerns raised have caused many surgeons to shy away from unsupervised attempts at gaining experience, which was the hallmark of the early years of minimally invasive surgery revolution. On-site mentorship (1) has been shown to be the most effective means of enhancing the training experience and reducing the learning curve mishaps. However, for surgeons in smaller communities, access to the expertise of skilled laparoscopic surgeons concentrated in tertiary care teaching hospitals can be difficult. 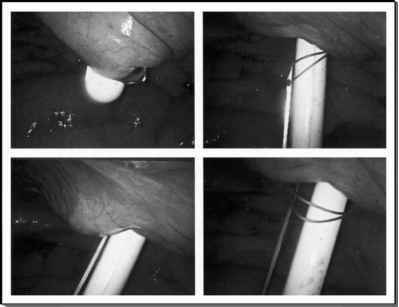 Thus, completing the supervised practice or mentoring recommended by the Society of American Gastrointestinal Endoscopic Surgeons (1) is a major impediment to many aspiring advanced laparoscopic surgeons. As a result, laparoscopic surgery for many procedures is not available to patients in rural communities without involving travel to a distant urban center and is completely unavailable in less technologically advanced parts of the world. However, recent advances in telecommunications and computer-aided surgical systems (robotic surgery) have the potential to revolutionize the field of surgery through the development of programs in telementoring and robot-assisted remote telepresence surgery, resulting in access to a complete range of minimally invasive techniques for patients in rural or remote areas. Utilizing Integrated Services Digital Network, Internet protocol, or satellite technology, telementoring provides a means for surgeons to acquire laparoscopic skills under the supervision of an experienced expert, ensuring high standards of surgical quality and patient care. However, it also has a number of significant limitations, mainly the fact that the expert surgeon is not physically present to assist and is unable to react and take over in case of complications or unexpected developments. Although such systems hold tremendous potential to transform the nature of surgical care, they have a number of obstacles that should be overcome, including prohibitively high start-up costs, safety concerns, and technical limitations of the existing systems. In addition to technology-related concerns, there are a number of issues concerning liability, confidentiality, and licensing, which will have to be addressed before telementoring and telerobotic surgery can gain widespread acceptance. from a remote location. The surgeon gains physical telepresence through the use of a master-slave telesurgical system with three robotic arms. One arm holds the scope and the camera and two perform surgical tasks. The surgeon's workstation provides a high-resolution view of the surgical field and the computer system transmits the movements of the surgeon's hands to the robotic arms.